I have a lot of corks hanging around. When my kindergartner had to bring in 100 of something for the 100-day celebration at school, I happily suggested wine corks. In order to avoid the suggestion that my daughter was being raised by one or more winos, I thought maybe we should do something creative with the corks. A sort of stealthy-recycling-camoflage project that would distract them from wondering why we had so many wine corks in our house. So, I gave this some thought. 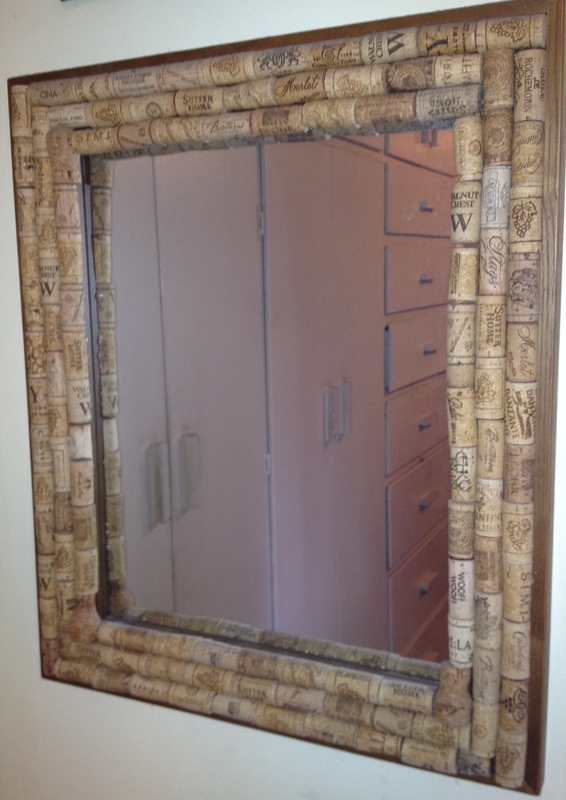 We bought a simple mirror with a wide frame and glued corks all over it. 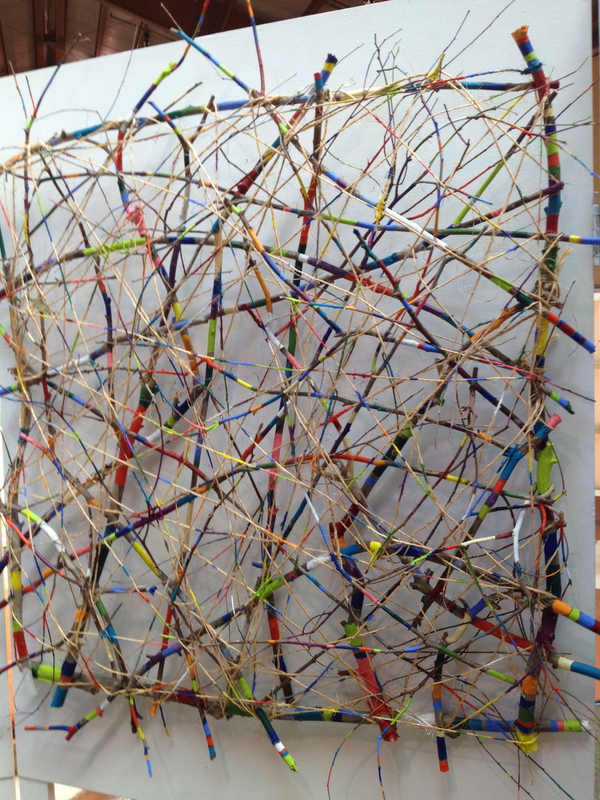 Not only is it decorative, but you can use push-pins to hang jewelry from it. It is useful and my daughter has had it ever since kindergarten. This is so easy to do, and the best part is collecting the corks. 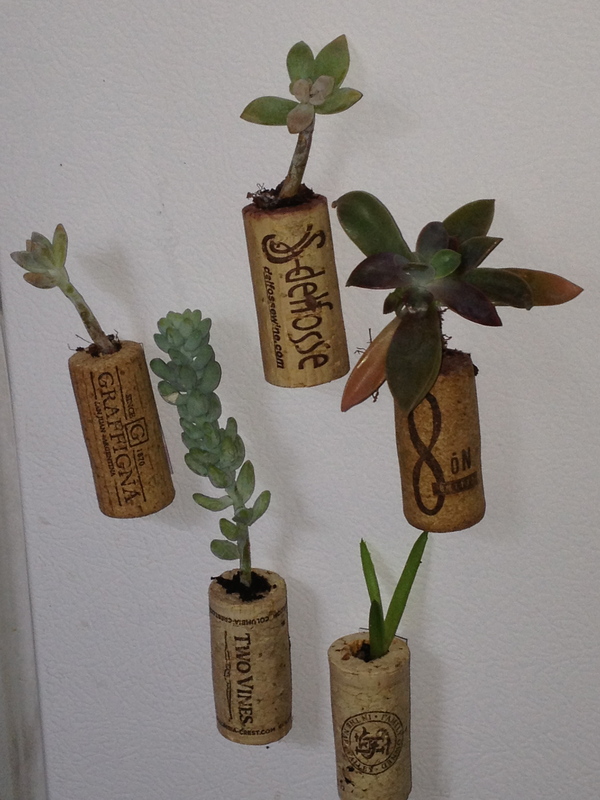 Another good use of corks is as little mini-planters. 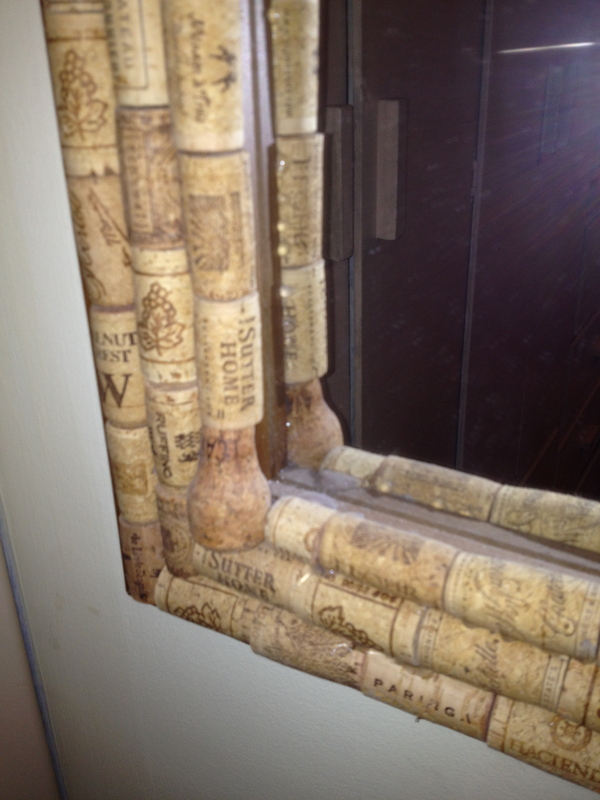 I drilled holes into the corks, cut up an old magnet, and used super glue to attach the magnet to the backside of the cork. I planted little cactus plants in the holes and stuck them on the side of my refrigerator facing the window. I now have a charming little garden in an unusual spot. 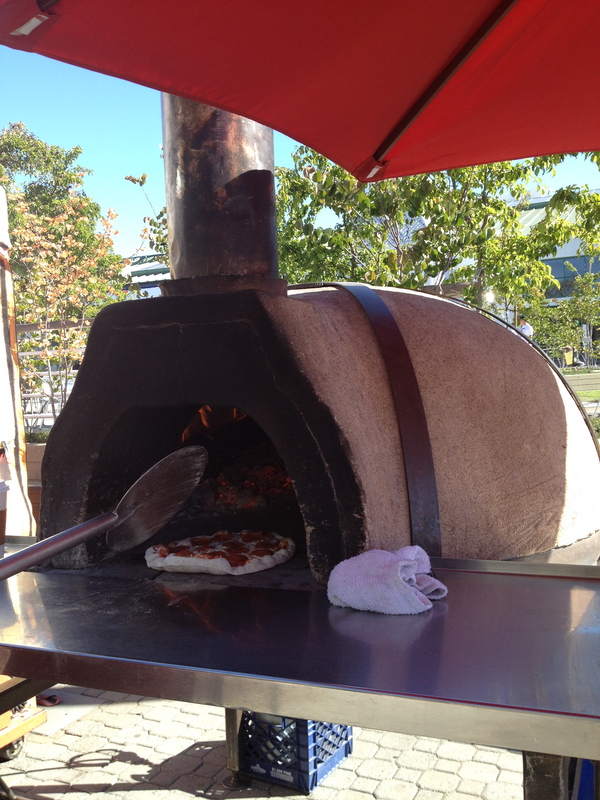 Cork is valuable and has endless possibilities for any do-it-yourself-type person. I recently saw a backsplash that was “tiled” with sliced corks and then sealed. If you use the end that was in the wine, you get a nice color variation. What a great idea, especially for a bar area. 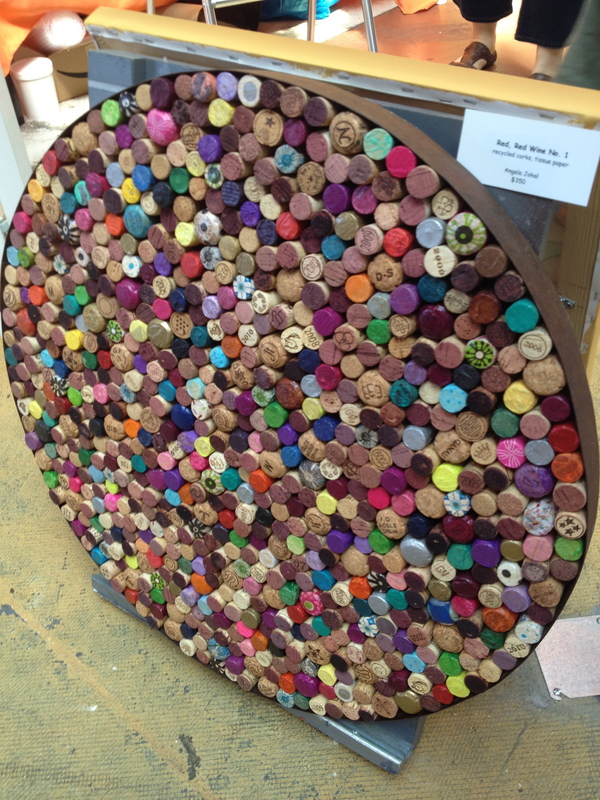 I recently saw this quirky piece of art work as well, made almost entirely from corks. This is a fun piece of found art. 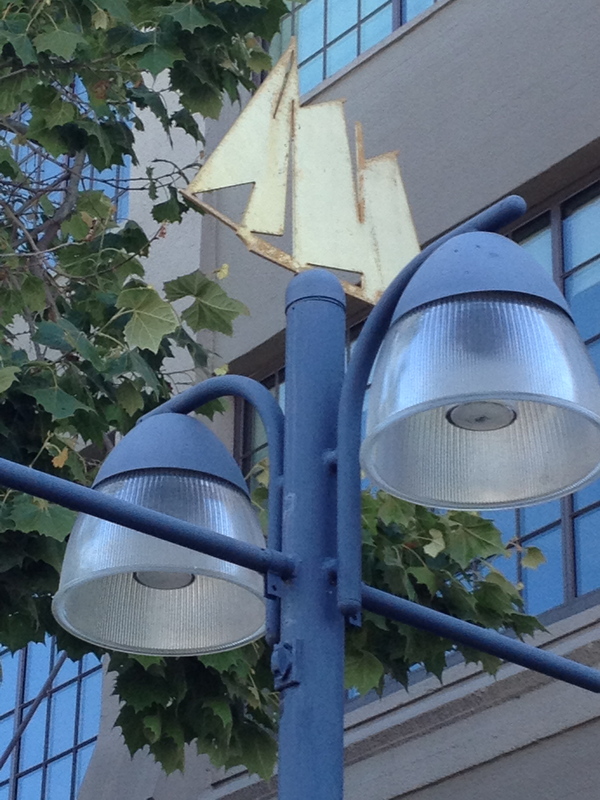 Cork Art seen in Oakland, California. Next time you uncork a bottle of wine, don’t toss the cork. Save it until you have enough corks to make a trivet or coasters, or even just to remember which wines you like. You may get inspired to use them up for something cool. Just wait and see. This is very good news if you love to drink wine, or even if you just know of someone who does. I love maps. Old maps, new maps, inaccurate maps, it doesn’t matter. I love how useful they are and yet they have a certain decorative appeal. The colors are generally soft blues and greens, or even vivid browns, yellows, and deep blues. Ever since my husband started bringing home expired airplane charts from the Air Station where he worked, I have tried to think of different ways to use them. 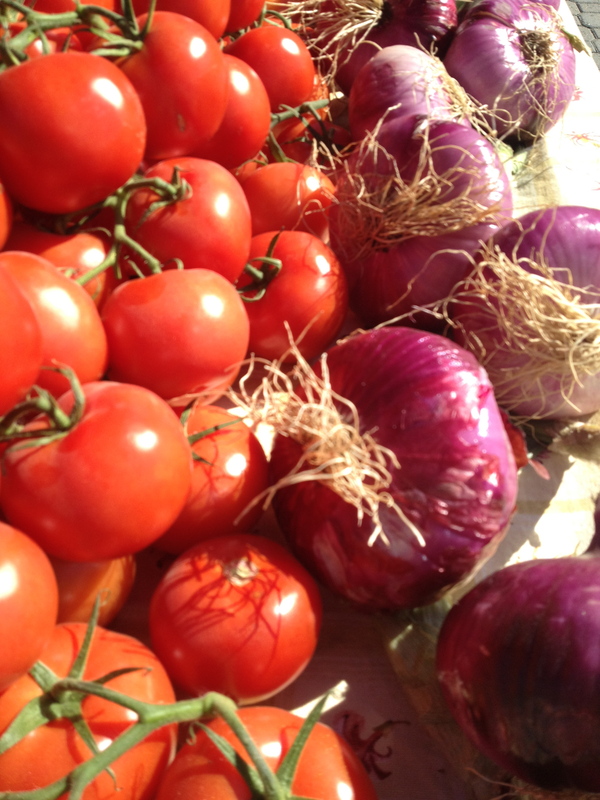 It is a place where form and function meet beauty. 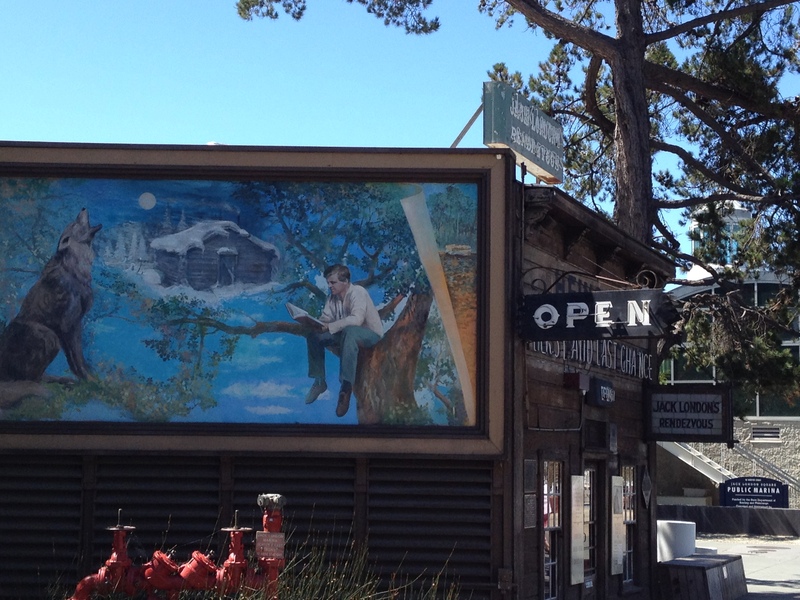 They can conjure up images of places you have been, or just help you daydream about where you want to go. They scream ADVENTURE! 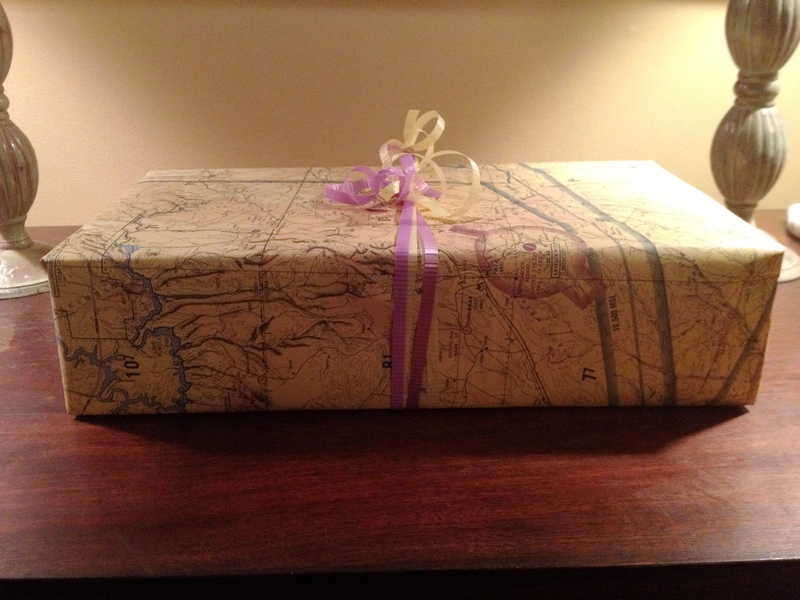 Present wrapped with an old airplane chart. I generally use the old airplane charts to wrap gifts and if I am feeling spunky, I make sure the chart or map I am using somehow relates to the person I am giving the gift to. 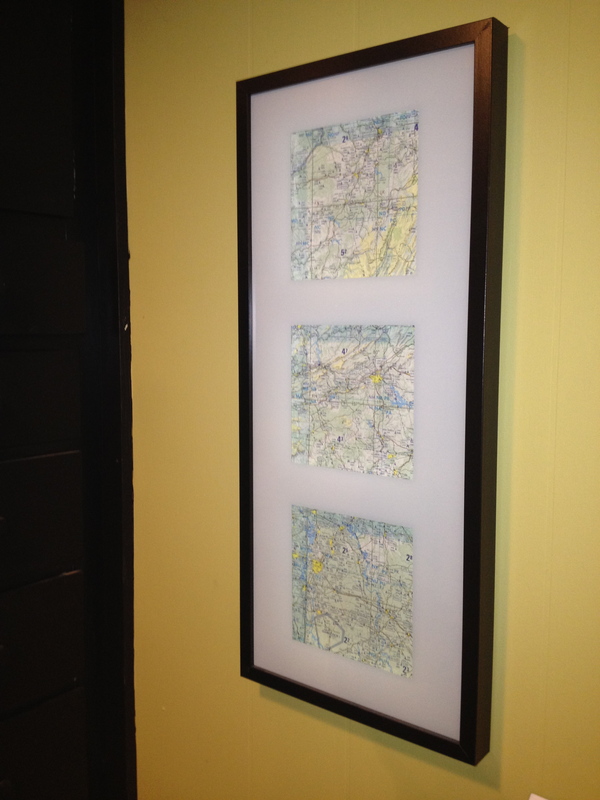 When I decorated my husband’s office last year, I used two shadow box frames, and framed two airplane charts from places where he used to fly often, making it personal and unique to him. Shadow box framed airplane chart in my husband’s home office. 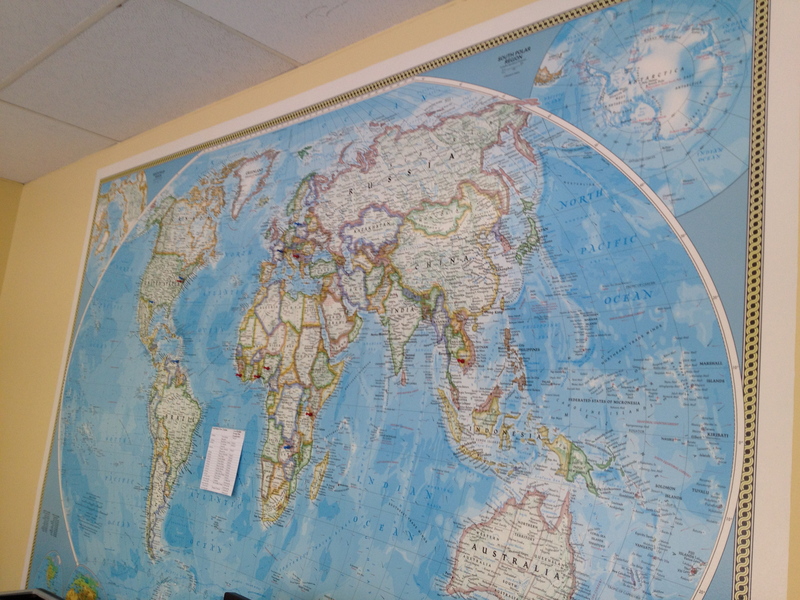 At the office where I work, the large world map is along one entire wall of the conference room. This is appropriate because it is an international aid organization. We have little red and blue pushpins all over the map to show where our programs are located around the world and where the staff are originally from. This is a source of water cooler conversation and inspires us to think globally, not to mention practical when I have to remember where Timbuktu is actually located. Conference Room wall at Partners for Development, an international aid organization. I have often thought I would love to tear the pages from an old atlas and wallpaper a bathroom, surely providing me with hours of endless entertainment while on the toilet. 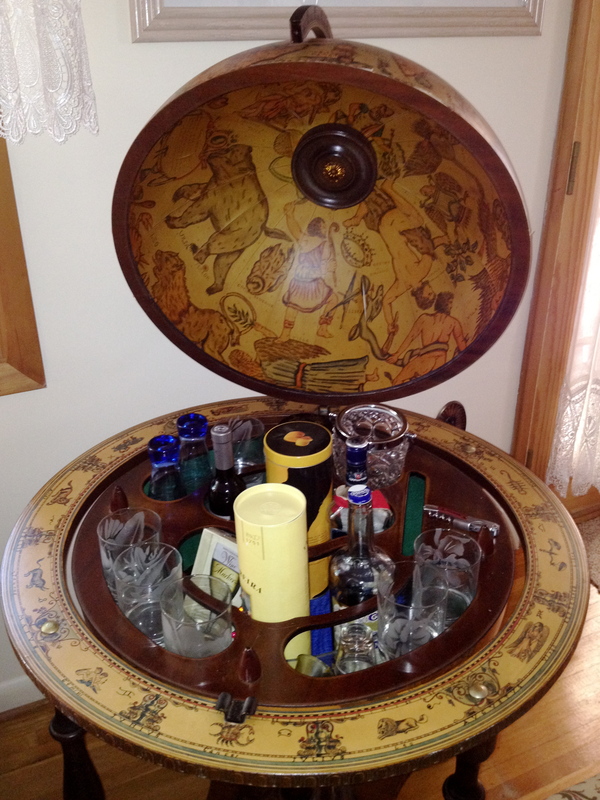 Or even just use the maps to line the bottom of a serving tray, or to line the outside of an old suitcase. Just finish it off with an acrylic sealer. 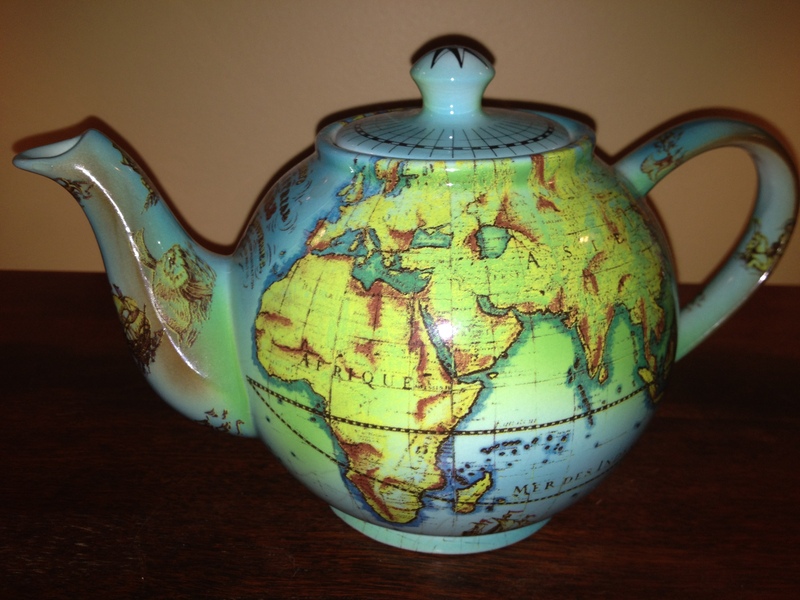 I have a teapot that resembles a mini-globe. 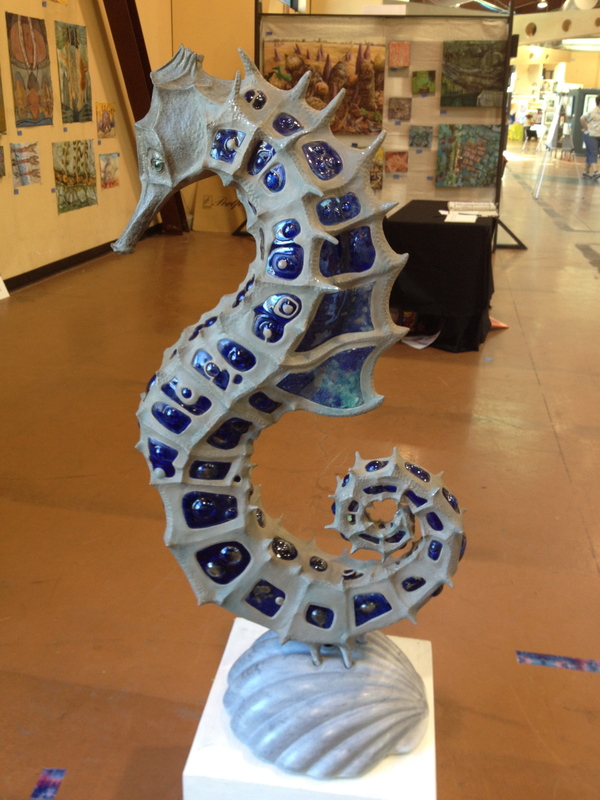 The globe itself can stand alone as sculpture and come in so many colors and shapes. 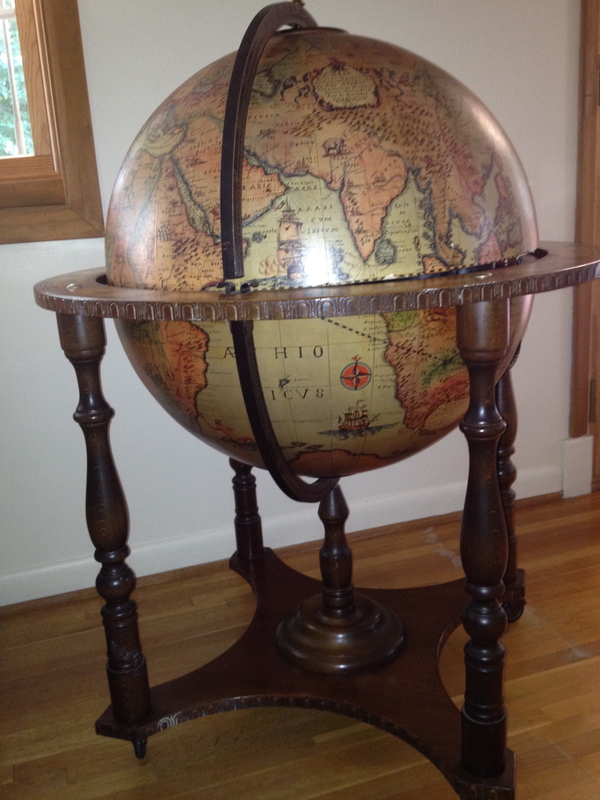 This free-standing globe, pictured below, came directly from Italy and is hiding a full bar inside. Love! Globe doubles as a bar! 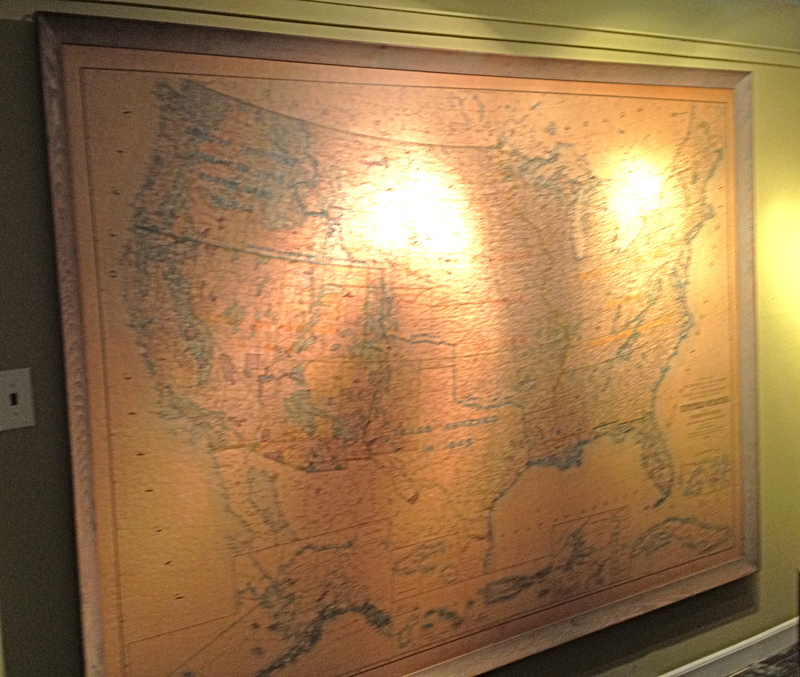 The old United States map on my family room wall is a favorite here in our home. The colors have aged into subtle blues, greens, and yellows and I love it’s presence. It seems to hearken back to a time when computers did not rule the world. Maps add a sense of nostalgia, were a valuable resource, and an indispensable source of information. It is easy to track down old maps or charts. Try making a phone call to an Air Station, local airport with a flight school, or military airbase. They update the charts regularly and would probably be willing to give the expired ones away for free. Try the GoodWill (I refer to it as GW & Co.) and see if there is an old atlas lying around and once you have a few old maps, get to work and let the adventures begin! I have just chosen the colors for my new house. I know this may come as a shock to you, since you didn’t know we were getting a new house. But we are and I am very excited. The best part is, it is just across the driveway, only next door. I no longer have to steal the figs, herbs, and flowers from their yard. I can stop yelling at my dog for pooping on their lawn. It will soon be my fig trees, my lawn, my herbs and my bay plant. 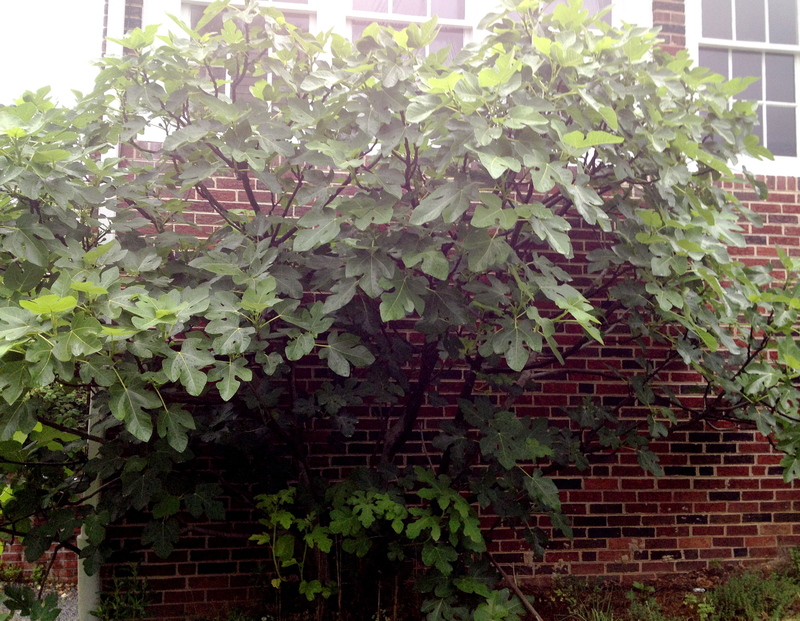 The fig tree, my favorite fruit. 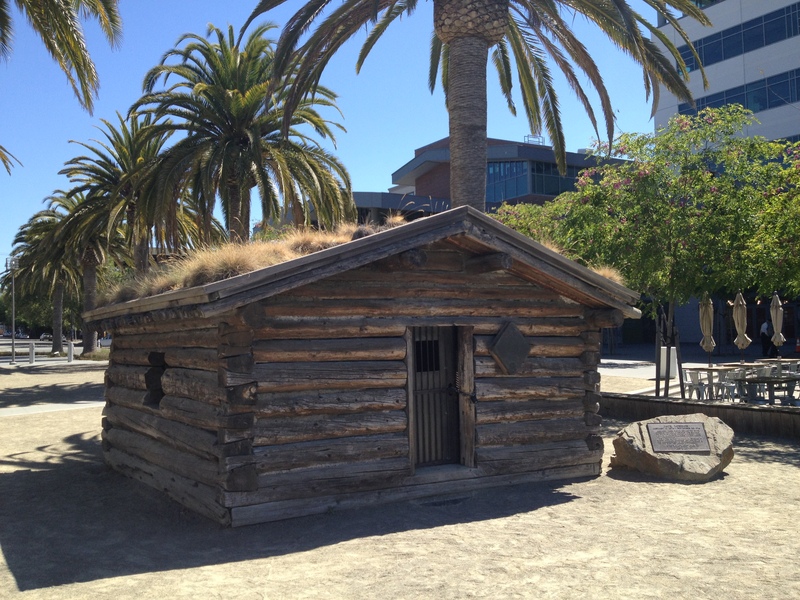 This new house is quite different from our current house. I won’t tell a lie, it does need a little updating and work, but the bones are good. I am excited to have more space, more closets, and for the first time ever, a garage! 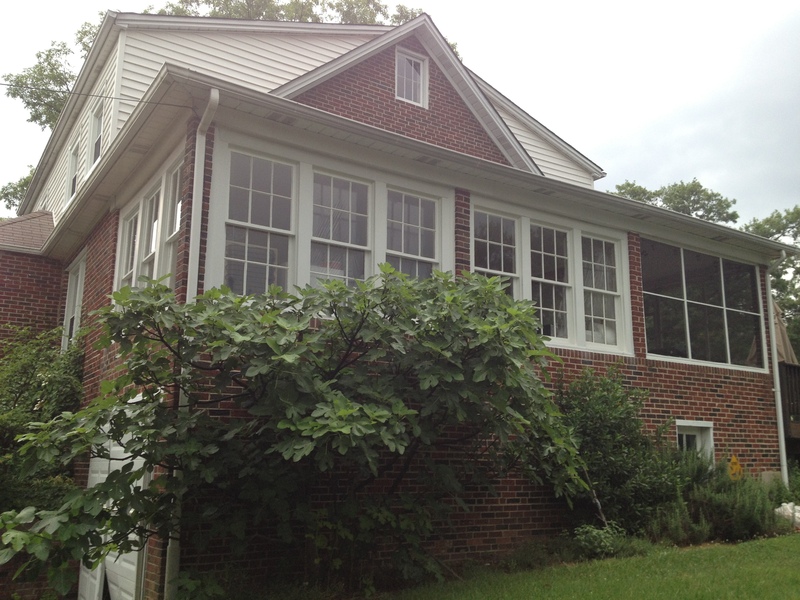 It is a craftsman era house, but with a more traditional layout. All of the original woodwork is still unpainted and intact. And yes, in case you were wondering, we are buying this one, jumping in with both feet. So if you were considering investing in the real estate market right now, you may want to reconsider, as we have a most horrible real estate track record and this could be considered a “bad indicator”. View of our new house, from our current house. Our new house, from the front. 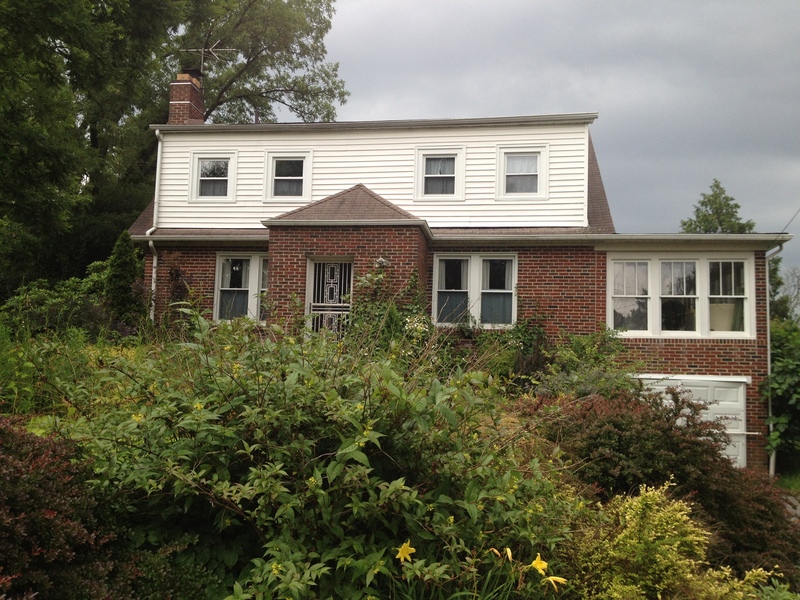 I am looking forward to showing you the progress as we renovate this house and turn it into our home. 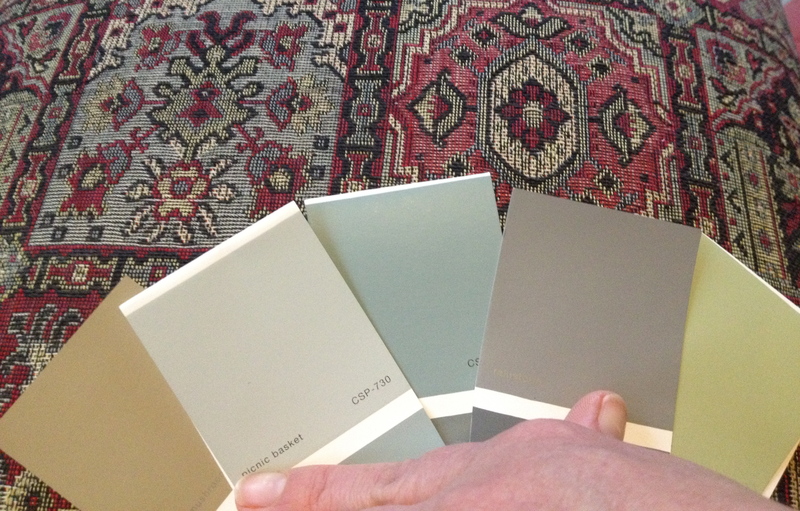 I have chosen the paint colors for the main floor, using as inspiration a set of ottoman/stools I bought recently. 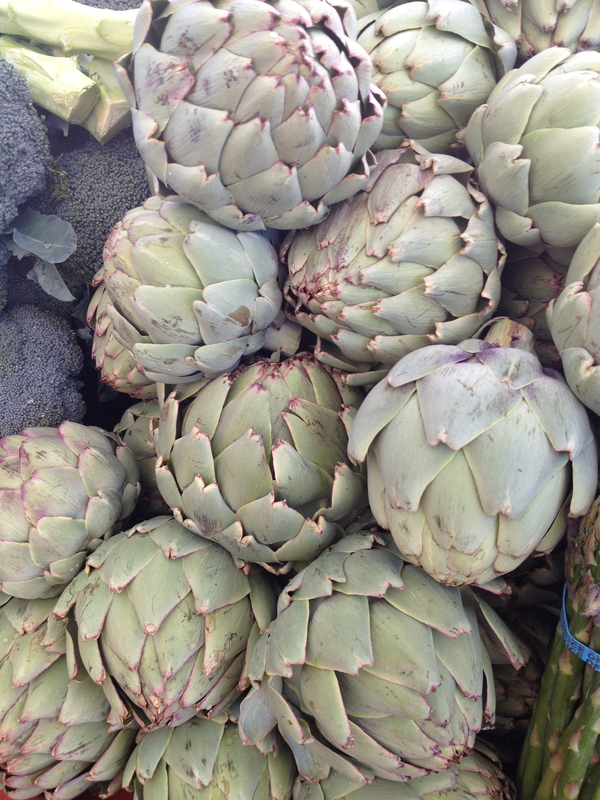 They have a woven top that resembles a beautiful rug with pale blues and greens mixed in. I am going to use cool colors in this house which is a trick for making the walls recede and the rooms feel a little larger. 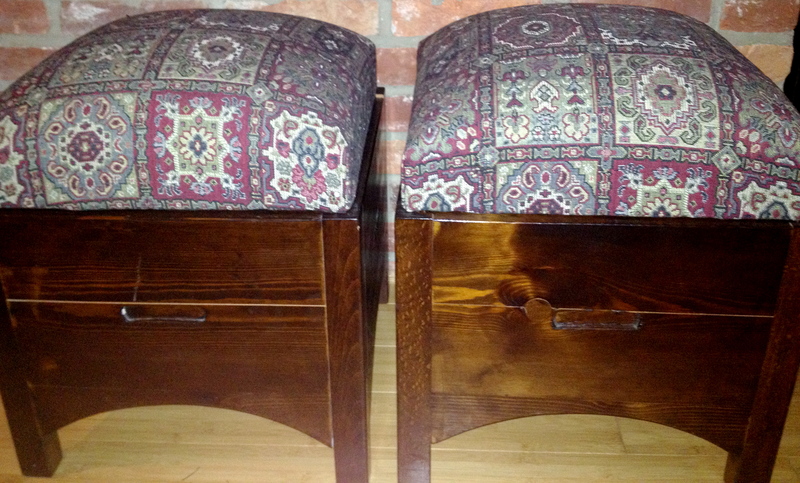 A pair of stools with a woven top. Of course, changing things up will be fun. The colors are from Benjamin Moore’s latest collection called “Color Stories”. These paints have no filler colors and are made with pure pigment. This color collection is inspired by nature and will bring depth to the walls and add a richness that you can’t achieve with a regular paint. The colors will change throughout the day with the light keeping it interesting. I can’t wait to show you the results. Here is a peak at the colors I have picked, of course, subject to change on a whim. “Color Stories” by Benjamin Moore. In order from left to right: shiitake mushroom, picnic basket, mystic lake, rainstorm, and spring has sprung. This new house is a practical decision for us and I have been itching for a change. I am looking forward to this new adventure and to being able to eat as many figs as I want. If the neighbors ask nicely, I might be willing to share.